The latest Constellation Research state of the state report explores the impact of digital transformation on the services front. As so many different pieces of the digital transformation space come together, Constellation believes that the Digital Transformation Services category is set to explode in 2015, and we forecast it to surpass $100.7B in 2020. Since the Digital Transformation Services have been poorly defined and often confused, in this state of the state report, Constellation defines the space, provides a high level overview of the seven key pillars, and notes various provider categories. At the core, this report is about a big shift that has occurred with customers. When it comes to Digital Transformation Services, most customers seek turn-key solutions and no longer have time for extensive vendor selection efforts. In fact, customers now prefer close knit partnerships between service providers and technology vendors versus an objective arm’s length relationship. On the other hand, the pace of change coupled with customer desire for quick results will lead service providers to develop the last mile solutions, and technology vendors to partner with service providers to guarantee a successful outcome. Constellation believes that this shift in digital transformation services will initiate the blurring of product and services for years to come. As with the core digital transformation market, neither technology vendors nor service providers will be selling products or services. In fact, they too will be delivering on outcomes and experiences. This report sets the premise for Constellation’s forthcoming reports on the Digital Transformation Services category; and offers insights into five of Constellation’s business research themes — Data to Decisions, Digital Marketing, Matrix Commerce, Next generation customer experience, and Technology Optimization and Innovation. Ready for digital disruption by starting with mobile? Add your comments to the blog or reach me via email: R (at) ConstellationR (dot) com or R (at) SoftwareInsider (dot) org. 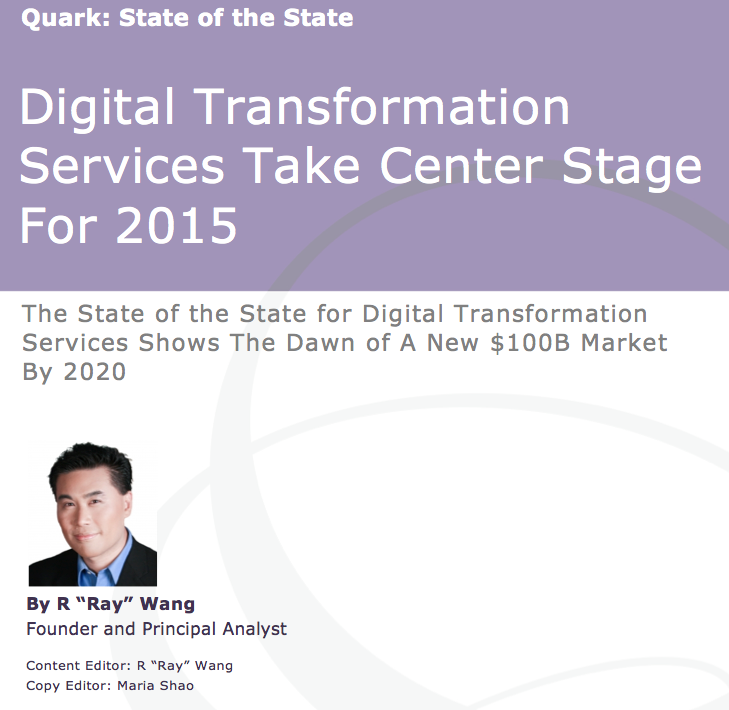 The post Research Preview: Digital Transformation Services Take Center Stage For 2015 appeared first on A Software Insider’s Point of View.